Established after the Lateran Pacts of 1929, the Vatican is the modern version of the State of the Church that ruled most of the central regions up to the Unity of Italy in 1861. The Vatican City is an independent state where the pope is the highest authority. They have a postal service, a newspaper, a radio station and an army, the Swiss guards. Even though Switzerland today has the reputation of being a pacifist nation, in 1500 it had an unstoppable military force. With their great ability to handle the halberd, a combination of a spear and an axe, the army ground troops were able to demolish enemy legions on horseback. After witnessing their power in battle, Pope Julius II (the commissioner of the Sistine Chapel) wanted some soldiers as personal guards. 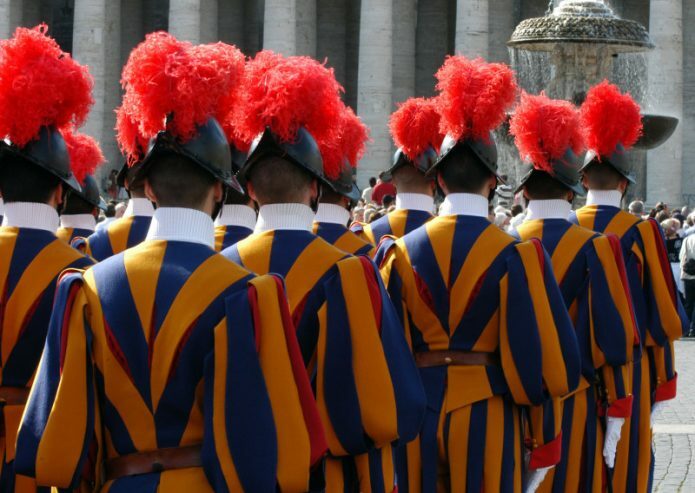 Since then, the Swiss guards swore allegiance to the pope. Even though we are used to seeing Swiss guards in Renaissance dresses, in fact the real Pope’s guards are wearing much more modern civilian clothes and arms than halberds! The death penalty remained in force until 1969 as the punishment for the attempted or done murder of a pope. In that year Pope Paul VI made it de facto but not de jure invalid, which meant that was officially abolished, but was not completely removed from the Fundamental Law (equivalent to our Constitution). It was definitively abolished with the revision of the latter only in 2001 according to the will of John Paul II. According to a study conducted by the German magazine Der Spiegel in 2007, the Vatican is the country with the highest crime rate in the world per inhabitant. There have been 486 criminal cases and 341 civil cases on which the Vatican Ministry of Justice has investigated. The most common crime? Theft. But How much Money Own the Vatican? It is not easy to answer because the accounts of the Vatican’s economic activities have not been published for 125 years. Only in 2012, following the policy of transparency and rigor put into effect by Pope Francis, the IOR (Institute for Religious Works) had to publish the 2012 budget, showing a profit of 86.6 million euros. If you want to know the current budget, see the 2015 report published on the official portal. In the past, in the days when the Church celebrated its most solemn feasts, the dome of the St. Peter’s Basilica was illuminated with a flame of fire: the pans on which the fire burned were lit by so-called sanpietrini, who climbed along the dome’s curves. The remarkable ability of these intrepid climbers was an object of admiration for foreigners, who considered the enterprise possible only by those who had been practicing it since the youth. The sanpietrini word is used also for the blocks of leucitite (an eruptive rock), also called flint or paving stone, used to make the typical Roman pavement. The Colosseo (Colosseum) – What is it like?